Sometimes the world poses for photographs. 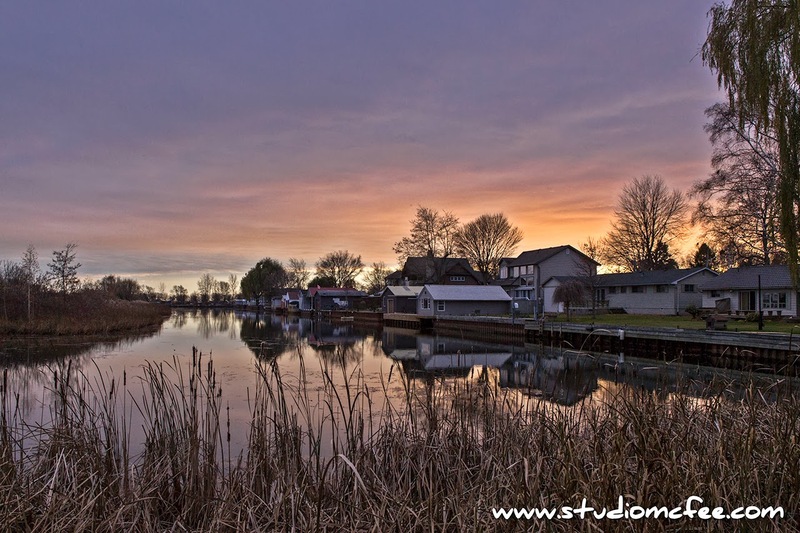 While exploring the north shore of Lake Erie, we visited the town of Turkey Point just as the sun was setting. Views of the town and the lake were lovely but this scene presented itself as we turned onto a side street. I couldn't quite believe I was seeing this: Homes and trees backlit by the setting sun, reflected upon water, with grasses in the foreground. The photo was already composed. But I was also entranced by the nature of the light. There was a kind of metallic glint to the grasses and water, almost as if touched by frost. The image very quickly became one of my favourites. Turkey Point ON is located on the bay formed by Long Point in Lake Erie. It is a popular summer destination not far from Simcoe, Port Dover, Port Rowan and Long Point.